Is it just coincidence that this season seems to have more exciting races than we have seen in a long time? Hockenheim is merely the latest in a long list of supposedly boring circuits that have produced great races this year. Admittedly, it took a suspension breakage on Glock's Toyota that brought out the safety car and a strange strategy decision from McLaren to enliven this one, but the result was a race to remember. Without that safety car period, this GP would have been completely characterless, so great was Hamilton's advantage over everyone else. With hindsight, one might even wonder whether the team kept him out while everyone else pitted so as to set up a nail-biting finish; it certainly produced that result, including some trademark Lewis overtaking moves. And it has to be said: Ferrari do not have the best car this year - Hamilton in a McLaren is better. Kovalainen's performance in the last few races has shown that there is very little to choose between the red and the silver cars; it is just that Hamilton seems to have inherited Alonso's fabled three tenths of a second, if not more. The team mate situation is perhaps the most interesting factor in this battle. Ferrari have a difficult task in choosing whether to back the sometimes brilliant, sometimes average Raikkonen, or Massa, who is quick on an open track but not much of a racer. I suspect that the team are making a serious error in not leaning towards Raikkonen, whose racing skills are beyond question. It may be that an over-concentration on qualifying is also killing the Italian challenge. Just think back a few years - how often did we hear Michael Schumacher say that he was not too concerned about pace in qualifying because the Ferrari was quicker in the race? And that was when overtaking was almost unheard of. After the disasters of 2007, McLaren have a much happier situation. There is no longer any question of which driver is quicker; Kovalainen is talented but not in the same class as Hamilton when it comes to racing. It is an ideal pairing, in fact, a driver who is becoming the best of his day and a team mate who is quick and uncomplaining. If McLaren can defeat Ferrari at Hockenheim in spite of such an awkward timing of a safety car period, then they will have to make mistakes of monumental proportions to lose both championships. Unless BMW can work a miracle in the races to come, that is. It seems unlikely at present, with the performance gap to the big two apparently widening. The BMW was not good at this track and that was not helped by Heidfeld making a mistake on his last qualifying lap. But he came good in the race, as ever, and Kubica must be wondering how he does it. That is a question that is worth looking at closely. Nick did this time and again last year, coming from behind to beat his team mate; is it luck or racecraft making the difference? In this race the safety car period helped Nick a lot, allowing him to leapfrog several cars that chose to pit while he stayed out. That left Nick able to be very quick in a light car until his final pit stop, thus netting fourth place. Meanwhile Kubica had fallen down the order to an eventual seventh. So events did play into Heidfeld's hands but he was well up the order even before the SC period. Fastest laps mean little, as Kimi has so ably demonstrated over the last several races, but Heidfeld's in Germany does at least show that he is every bit as quick as his team mate, if not faster, once the tires are warmed up. Let him qualify as well as he expects to in future and I think Nick will emerge as the leading BMW contender. Now that Piquet (of all people) has given Renault their highest finish of the year, doubts will be raised as to BMW's ability to remain the third team in F1. It was a great performance by the rookie after all his troubles this year but was hugely assisted by a one-stop strategy that proved optimal after the SC period. Renault's real position in the pecking order is better shown by Alonso's degenerating position throughout the race - the car is about on a par with the Toyotas and Red Bulls. I do not include Toro Rosso in that group because I think that only Vettel's qualifying skills are keeping them in contention. His ninth on the grid and finish of eighth were probably better than the car deserved. Williams too are struggling to keep up, while Honda and Force India scrabble for the crumbs. Hockenheim was an interesting race as an illustration of the comparative strengths of the teams and drivers but, without Glock's timely accident, it would have been no more than that. Instead, that broken Toyota suspension component gave us a chance to see just how good Hamilton can be when called upon to push. He begins to look unbeatable. Renaults maiden pole of 2008! It seems to be crystal clear who the best driver is at the moment. What suprised me was how poorly Kubica & Kimi finished. Piquet was really a bit of a fluke, don't you think? Piquet had incredibly good luck in pitting just as the safety car went out - it really made his race. That, plus being on a one-stop strategy made his podium finish a bit flukey. But we should give him his due: he held off Massa in the closing laps and even managed to increase the distance a little. Kimi's car didn't look right until after the second stop and it was only then that he was able to push at all. And Kubica's car was very twitchy towards the end - he may have screwed his tires in the effort to keep up with the rest. But is that not a measure of Heidfeld's racecraft, that he is quick throughout the race? Surely it must mean that he knows how to pace himself and the car. As for Hamilton, he is a pleasure to watch, on the limit all the time, sliding the car through the corners but never losing it. And he will get better still as he gains experience! so I ask what has happened to the Ferraris? A few races ago they were miles ahead of their closest competition however recently they have been mired amongst their rivals; appearing to take a step back. Is it a lack of development by Ferrari, a massive improvement by their rivals, or are Ferrari simply failing to set the car up properly for their drivers (Kimi specifically it seems)? That has to be a matter of opinion, Andrew, and probably even Ferrari would love to know the answer. My guess is that the team are beginning to panic slightly, aware that McLaren have recently taken a big step forward, and they are trying too hard as a result. Montezemolo doesn't help either, with his muttering about the team making mistakes. I think it's safe to say that McLaren have found a bit more extra performance rather than Ferrari slipping backwards - the other teams don't seem any closer to Ferrari anyway. But the effect is to increase pressure on the team just at the moment when they should be working hardest to catch up. It's an old story - once the car is no longer the best, the drivers begin to get the blame and the whole team ends up in disarray. And that's where they are missing Todt most severely. I don't think Domenicali has the strength of will to stand up to Luca as Todt used to. I really have no idea what Ferrari should do with their drivers. It's not like they are running line astern regulalry to give them an opportunity to 'make the phone call' as Irvine used to call it. Over the weekend I have come to the conclusion that Kimi must be retiring because there is no logical reason why Massa is beating him by so much so often. Massa gave away a place to Lewis so easily it was embarrassing. Trulli(or was it Fisi) got sacked by Flav for doing that at the last corner in France a few years ago. Piquet drove really well. He was lucky to be in the lead and didn't put up much a fight against Lewis which was probably smart because Renault needed a podium and it was not worth risking an accident. Piquet did a great job to hold of Massa at bay despite having a car that is nowhere near as good. Sure, there is no logical reason why Massa should beat Kimi so often, Steven. But I cannot see retirement as being the reason for the Finn's disappointing performance; would that not make him fight the harder, to go out in glory? I think it's that old bugbear, Ferrari politics, gradually infecting the team and ruining both the atmosphere and their competitiveness. We always thought this would happen - it is just taking longer than we expected to overcome the habits of the Todt era. I remember last year hearing a commentator joke about the use of the newly created verb "to podium". Who knew it was possible for a dry race to be good? Have we had one of those? Oh, yes, the last good dry races were both in Canada, and also required safety car periods to create the actual drama, didn't they? You hit it right on the nail there, Clive. "We're seeing Lewis Hamilton morph into Michael Schumacher right in front of our eyes." Is it just me? Are you guys able to observe the difference in Kimi's approach to racing? I feel he has changed from a 'push-to-the-limit-no-matter-what' McLarendriver to a 'take-a-calm-collected-wait-and-watch-approach' Ferrari one? It seems so uncharacteristic of him. Clive, I would like to know your opinion on this. Could it be the politics as u mentioned? I feel it has more to do with the racinn engineer. Journeyer: Almost since he entered F1, people have been saying that Hamilton is the new Schumacher or the new Senna. Of course, he is neither, being less polished a communicator than the Shoe and less intense than Senna, but his career may begin to resemble theirs. There were moments during the Hockenheim race when the similarity to Schumacher's driving was most apparent, particularly after Hamilton's final pit stop. I thought the team had blown it for him but he just knuckled down to it and did what was necessary. That is Schu-like - the confidence and ability to avoid panic. Then there is the smoking front tyre as Hamilton spears the car into the corner, so reminiscent of Michael. But Lewis does more, sliding the car rather than lose speed and catching it before it can lose grip completely. He sets it up before the corner, taking the slide into account, and then just rides the beast with barely a correction. Brilliant stuff, especially in a modern car that is designed to grip the road above everything else. When the downforce is cut next year, this guy will be completely untouchable. 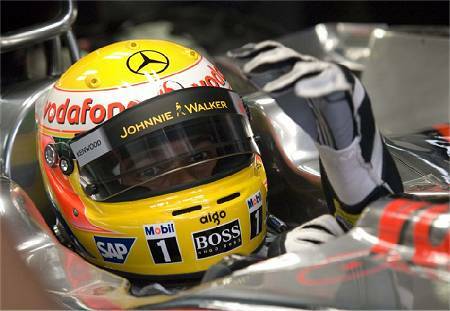 Careerwise, I think Hamilton will be more like Senna. Everyone forgets how many races Ayrton lost through bad luck, mechanical breakage or an instant of inattention. Lewis is already showing that his luck is not all good but the reliability of the car is so much better now that the only thing he has to worry about is that occasional brain fade. Remember how often Ayrton would drive off into the distance, only for something to go wrong; Hamilton shows signs of doing the same and it his one weakness. He wants to win every race and will push when there is no need to - just like Senna. The harder a driver pushes, the more likely it is that something will go wrong and Lewis has a pretty good collection of that sort of race already. But they should never try to change him. That drive is part of his talent and to teach him to be sensible will rob him of his greatest asset (just as it has Kimi's). He will win more races than Senna because the car is more reliable, but he will lose more than Schumacher because he will never be a percentage driver. Bluray: When Kimi went to Ferrari, we all thought he would blow everyone away, expecting that ferocious will to race to be carried with him to his new team. As we have seen, it did not happen and I think the reason is revealed in Kimi's comments when he first arrived at Ferrari. He made it clear that he was there to win the championship and threw in a few disparaging comments about life at McLaren. That showed that Ferrari expected a different mindset from him - no longer was it a carefree matter of giving your all in every race, now he was to drive to tot up the points. And it just isn't Kimi's style. We learned to love Kimi while he was at McLaren because he drove his heart out trying to win and was so often thwarted by the car or circumstance. My memories of him at the time contain as many pictures of Kimi throwing it off the road as they do him battling through to a win. And that was Kimi - all or nothing. But he wanted to be champion and so went to the team with the fastest car. They took him and explained what was needed to win a championship - Kimi listened and did as they said. No wonder he so often looks bored out of his mind; he needs to race, not to add up the scores and calculate what remains to be done. The result is what we have seen over the last eighteen months: a Raikkonen that is great when the car is best and uninspiring when it isn't. If I am right in thinking that the Ferrari will continue to lose ground to the McLaren, we will see fewer and fewer days of Kimi brilliance. They have turned him into a Massa. I think Kimi may be a Scheckter. Spent his whole life trying to be world champion and once he had done that he had no motivation to race any more because he achieved his goal. I agree with Keke Rosberg. Lewis reminds me of Gilles and I can't imagine I have ever compared a driver to Gilles. When the car is good he is smooth and gets the best from it. When the car is bad he drags it by the scruff of the neck into places it shouldn't be and there is the need to win everything. His drive at Silverstone took the mind back to Gilles destroying everyone in a practise session at the Glen. Jody came in (on his way to winning that years championship) convinced that no-one could have gone faster only to be told Gilles had beaten his time by 11 seconds(for anyone unfamiliar with this story I do mean 11 seconds) . Jody was interviewed in last month's Motor Sport or it could have been F1 racing and 30 years later you can still feel his disbelief and lack of understanding of how that was possible. I think a few of Lewis's team mates will have similar futures but we are not going to see an eleven second gap again. People seem to have arrived at the conclusion that the McLaren is clearly better than the Ferrari but that is not how it looks in Kovi's hands. I think Lewis is just so far ahead of the rest of the drivers that he is making a good car look way better than it really is. For the first 10 or so laps yesterday he was taking an average of 1.2 seconds a lap out of his team mate. How is that possible? You may be on to something with the Jody Scheckter comparison, Steven. Jody was no slouch and it must have been a shock for him to arrive at Ferrari and find that he was teamed with a rocket like Gilles. He won the championship, as per the script, but he must have known that it was courtesy of Gilles, who so often dutifully sat behind him when we could see that Gilles was faster. But that second year must have been soul-destroying for Jody, Gilles now released to do whatever he could and the world champion reduced to picking up the crumbs. No wonder he retired. Kimi may be in a slightly different situation in that Massa is no Gilles; but the Brazilian is still the guy that learned a few tricks from Schumacher and refuses to take a back seat. After having scraped a championship (rather as Jody did), I can see that Kimi would be inclined to think that he really doesn't need all the pressure. As for the McLaren, I think it was marginally the better car at Hockenheim. Hamilton made it look the best by far but Kovalainen is the true measure of its capabilities, as you say. Massa was quick in practice and qualifying so the Ferrari was clearly quick enough to compete - and then Hamilton waltzed away from it in the race. I can see no other possible conclusion than Hamilton being the difference. He is that good. Suddenly I realize why everyone thinks so highly of Vettel; he is the only potential future competition for Hamilton, now that Kovalainen has been proved not quite good enough, Kubica probably no better than Heidfeld, and Alonso already beaten. It's nice to see you coming around about Lewis. I think by the end of the year there will be no doubts about his brillance in an F1 car. At least I didn't rubbish Hamilton when he was making mistakes earlier in the year, Don. In fact, I was probably the only one to attempt an explanation of his red light fiasco with Kimi in Montreal. I don't think driver abilities vary from race to race as the popularity polls would have us believe - Hamilton is good and getting better and is the same driver who made mistakes earlier this year. As you say, by the end of the year, the doubters will be silenced (and they will probably hate him the more for it!). steven roy i'm glad to hear someone else is thinking kimi may sit out next season. i know he said he wouldn't break a contract but i also recall him saying something about how he loves driving but when the things he doesn't love about it start to outweigh that then it's time to go. i've been wondering ever since i read that if he wasn't in the process of making a decision. the other thing i've noticed is how relaxed he seems otherwise. he's never really visibly tense but i think i've seem more smiles this year than before and almost an offhandedness, (ok, the photographer incident aside, but really i wouldn't have blamed kimi for tossing the camera across the track) it's a bit odd. Last season after a few races when Kimi was struggling I had a lot of arguments with people who said they thought Massa would beat him over the course of the season. I knew it just wasn't possible for Massa to consistently beat Kimi. This year I still expect Kimi to come out on top but he is being regularly and comfortably beaten by Massa and that doesn't make sense. Scheckter pretty much switched off overnight after he became champion and changed his personality completely. Every year at that time the F1 press used to present a prix orange to the most open and helpful driver and the prix citron to the least helpful driver. Year after year including his championship year Jody won the citron. The following year despite an awful season that among other things saw him become the only reigning champion to fail to qualify for a race he won the prix orange. The 1980 Ferrari was a dog and Jody failed to qualify in Canada. Gilles not being greatly concerned by the laws of physics dragged it kicking and screaming on to the grid and finished fifth. It defies belief.